The ASIS 28th New York City Security Conference & Expo provides an unparalleled opportunity to network with thought leaders and learn about the most pressing priorities and challenges for security management professionals including the latest anti-terrorism tactics and critical security issues in urban areas. Make plans now to join more than 2,200+ security and law enforcement professionals from the public and private sectors planning on attending for two days of networking, top-notch education, and the latest security solutions on the market. The Person of the Year Luncheon on Thursday, May 17, 2018, from 12:00 – 2:00 pm to honor His Eminence Timothy Cardinal Dolan Archbishop of New York, as the ASIS NYC Chapter “2018 Person of the Year” for his dedication to the spiritual leadership to the people of New York. 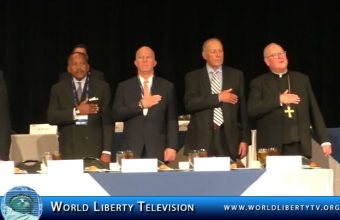 See More about ASIS , in our World Liberty TV Political Channel by Clicking here. Timothy Dolan was named Archbishop of New York by Pope Benedict XVI on February 23, 2009. He had served as Archbishop of Milwaukee, appointed there by Pope Saint John Paul II on June 25, 2002. Born February 6, 1950, Cardinal Dolan was the first of five children born to Shirley and Robert Dolan. His education began at Holy Infant Parish School in Ballwin, Missouri, and continued through the high school and college seminaries in Saint Louis. He then completed his priestly formation at the Pontifical North American College in Rome, where he earned a License in Sacred Theology at the Pontifical University of St. Thomas Aquinas. Ordained to the priesthood for the Archdiocese of Saint Louis on June 19, 1976, he served as associate pastor at Immacolata Parish in Richmond Heights, Mo., until 1979 when he began studies for a doctorate in American Church History at The Catholic University of America. On his return to Saint Louis, Cardinal Dolan again served in parish ministry from 1983-87, and then was appointed to a five-year term as secretary to the Apostolic Nunciature in Washington, D.C. When he returned to St. Louis in 1992, he was appointed vice-rector and professor of Church History at Kenrick-Glennon Seminary, as well as an adjunct professor of theology at Saint Louis University. In 1994, he was appointed rector of the Pontifical North American College in Rome, where he remained until June 2001. While in Rome, he also served as a visiting professor of Church History both at the Pontifical Gregorian University and the Pontifical University of St. Thomas Aquinas. On June 19, 2001 – – the 25th anniversary of his ordination to the priesthood – – then Monsignor Dolan was named the Auxiliary Bishop of St. Louis by Pope Saint John Paul II, choosing for his Episcopal motto the profession of faith of St. Peter: Ad Quem Ibimus, “To Whom Shall We Go?” (Jn 6:68). Cardinal Dolan served as chairman of Catholic Relief Services, and is a member of the Board of Trustees of The Catholic University of America. He is also a member of the Pontifical Council for Promoting New Evangelization, the Pontifical Council for Social Communications; and, at the Vatican, the Congregation for Eastern Churches, and the Congregation for the Evangelization of Peoples. Cardinal Dolan was elected to a three year term as president of the United States Conference of Catholic Bishops, in November, 2010. He now serves as chair of the Bishops’ Committee on Pro-Life activities. On January 6, 2012, His Holiness Pope Benedict XVI announced that Timothy Dolan was to be appointed to the College of Cardinals. Following the resignation of Pope Benedict XVI, Cardinal Dolan participated in the Conclave that elected Pope Francis in March, 2013. 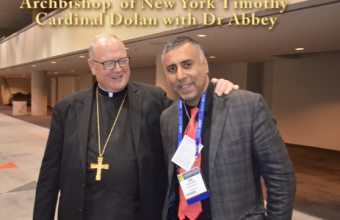 His Eminence Timothy Cardinal Dolan Archbishop of New York, was honored at the ASIS Person of The Year Luncheon 2018, Hear his very uplifting speech he delivered there. See more in our World Liberty TV Political channel by clicking here. 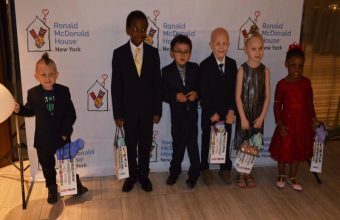 Ronald McDonald House® New York held its 26th Annual Gala last night at the Grand Hyatt New York’s Empire State Ballroom and raised more than $4.2 million to support families and their children battling pediatric cancer. The proceeds raised will also help support the House’s facility operations, which recently re-opened to a 95-room residence, enabling children to have life-saving treatment while keeping their families close. This includes six new suites for families with children who recently received a transplant, the only suites of their kind outside of a hospital in the country. This year’s gala was emceed by NY1 news anchors Cheryl Wills and Anthony Pascale, and honored President and Chief Executive Officer of Mastercard, Ajay Banga, and Chairman and Chief Executive Officer of G-III Apparel Group, Morris Goldfarb, for their contributions and service to Ronald McDonald House® New York. 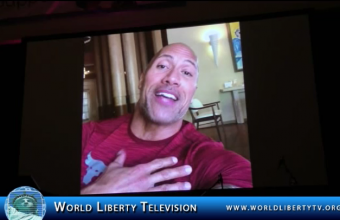 See more great charities like Ronald McDonald House covered in our World Liberty TV Humanitarian Channels by clicking here. Steve Madden is an American fashion designer and businessman. He is most well known as the founder and former CEO of Steven Madden, Ltd., a publicly traded company. In 1990 Madden founded Steven Madden, Ltd. He started out by having 500 pairs of shoes made to his own design and selling them to New York City-area stores from the trunk of his car. His first major success, the Mary Lou, was a variation on the classic Mary Jane style of women’s shoe. In 1993 he opened his first retail store. 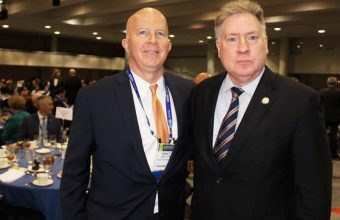 In the same year, seeking more capital, he entrusted his company’s initial public offering of stock to the Long Island securities firm of Stratton Oakmont, where Danny Porush, a childhood friend, was a partner. Even as his company thrived, Madden, as an individual, continued to deal with Stratton Oakmont and its principals until about 1997. Last year, Mr. Madden renegotiated his contract to include two stock grants valued at $80 million (that will vest from 2017 to 2023, which means he has to stay to receive them). But he says that money is no longer the important thing in his life. What began as a modest $1100 investment in 1990 has developed into one of the most iconic brands in footwear. From a factory in Queens, NY, Steve Madden has revolutionized the shoe industry, merging years of experience with unique and creative designs. Inspired by rock and roll and his New York roots, his vision to provide on-trend women and men with an outlet to express their individuality is innovative, daring, and inspiring. Steve’s innate understanding of trends and unparalleled willpower have resulted in millions of customers worldwide and propelled his designs to the forefront of fashion. He has expanded the Steve Madden brand into a true lifestyle and destination for footwear, handbags and accessories, sold in over 80 countries worldwide. It’s about authenticity. It’s about embracing individuality. It’s Steve Madden. 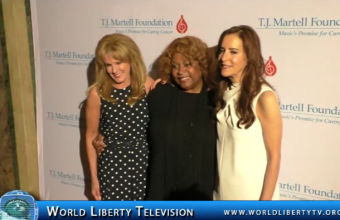 See More Fashion Designers in our World Liberty TV Fashion Channels by Clicking here. Rachael Ray was born on August 25, 1968, in New York. She held several jobs in the food industry before her signature “30 Minute Meals” classes were picked up by a local television newscast. She went on to host several Food Network shows, author tons of cookbooks, launch her own magazine, and start a nationally syndicated talk show, Rachael Ray, for which has been nominated for multiple Daytime Emmy Awards since its premiere and has taken home two. Rachael Ray hosts the syndicated daily talk and lifestyle program Rachael Ray, and three Food Network series (30 Minute Meals, Rachael Ray’s Tasty Travels, and $40 a Day). Other programs to her credit include Rachael Ray’s Week In A Day and the reality format shows Rachael vs. Guy: Celebrity Cook-Off, and Rachael Ray’s Kids Cook-Off. Ray has written several cookbooks based on the 30 Minute Meals concept, and launched a magazine Every Day with Rachael Ray. In November 2006, Ray became a spokeswoman for Nabisco crackers. She appears in commercials and on boxes for the many Nabisco products. Many boxes with Ray’s picture have her recipes. In 2006, Ray launched the Yum-O! nonprofit organization. Its mission is to “empower kids and their families to develop healthy relationships with food and cooking.” This is achieved by teaching families to cook, feeding hungry kids, and funding cooking education. See more Chefs in our World Liberty TV Food and Wine Channels by clicking here. The T.J. Martell Foundation for Cancer Research held its star-studded 6th annual 2018 Women of Influence Awards this week, on Friday, May 11, 2018 at The Plaza Hotel, Grand Ballroom located at 768 5th Avenue in New York. The reception began at 11:30 a.m. with a luncheon and awards to follow from 12:30 p.m. to 2:00 p.m. The awards celebration honored five outstanding women who have achieved tremendous goals in business and inspire other women around the globe to live their dreams while balancing work, family, home and health. Special Guests Robin Quivers, Steve Madden and others attended. 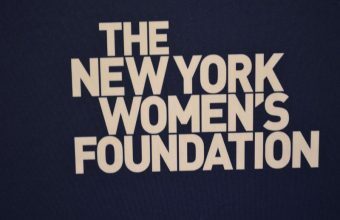 The 2018 Women of Influence honorees include Mindy Greenstein, Ph.D., Clinical Psychologist, Psycho-Oncologist and Author; Elizabeth Matthews, CEO, ASCAP; Dana Miller, CMO, The Hollywood Reporter and Billboard; Mary Pierson, Vice President of Denim Design, J Crew; and Rachael Ray, Television Host and Philanthropist. 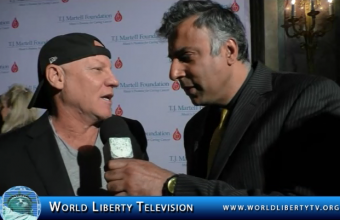 See more about T.J. Martell Foundation in our World Liberty TV, Humanitarian Channel by Clicking here. Wladimir Klitschko is a Ukrainian former professional boxer who competed from 1996 to 2017. He is a two-time world heavyweight champion, having held the WBA (Super), IBF and WBO titles, as well as the IBO, Ring magazine, and lineal titles. A strategic and intelligent boxer, Klitschko is considered to be one of the greatest heavyweight champions of all time. He was known for his exceptional knockout power, using a strong jab, straight right hand and left hook, as well as excellent footwork and mobility, unusual for boxers of his size. Throughout his career, Wladimir defeated 23 fighters for the world heavyweight title, beating a record previously shared between Joe Louis and Muhammad Ali at 21 beaten opponents. Klitschko also holds the record for the longest combined world championship reign in heavyweight history at 4,383 days; the most wins in world title bouts in the post-war heavyweight history at 25; the most wins in unified title bouts and the longest unified championship reign in professional boxing history at 15 title bouts and 14 consecutive defenses respectively; and has the second most total successful title defenses of any heavyweight boxer with 23 (including his first reign as WBO champion), behind Joe Louis (25) and ahead of Larry Holmes (20) and Muhammad Ali (19). Klitschko fought in 29 heavyweight title fights, more than any heavyweight champion in the sport’s history. He also holds the record of having defeated the most boxers with an undefeated record, at 12, and also defeated 10 current or former world champions throughout his career. 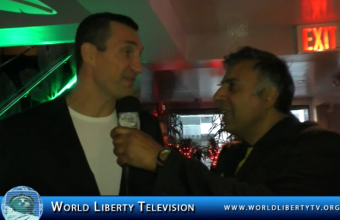 See More about Boxing in our World Liberty TV Boxing Channel by clicking here. During the times her parents thought she was in her bedroom, 14-year-old Cecilia Braekhus would creep towards her window, silently climb out and shimmy down the high fire escape on the side of the house to go training. Each time she wasn’t thinking about making history. She just didn’t want her parents to find out. She wanted to immerse herself into something that caught her attention on a TV commercial. A brief 30-second spot that launched a 10-year boxing career, changed a nation’s attitude toward professional boxing and continues to make history. Today, the Boxing Writers Association of America is proud to announce that Cecilia Braekhus, the undefeated 36-year-old Norwegian superstar, undisputed welterweight world champion and recognized by most women’s boxing experts as the No. 1 pound-for-pound female fighter in the world, is the 2017 winner of the Christy Martin Award, which is given to the BWAA Female Fighter of the Year. Braekhus becomes the first woman to be named female Fighter of the Year in the 92-year history of the BWAA. A select group of women’s boxing experts choose Braekhus from a distinguished list of nominees that included Jessica Chavez, Naoko Fujioka, Mariana Juarez, Amanda Serrano, Claressa Shields and Katie Taylor. In 2017, the “First Lady” successfully defended her five world titles three times, defeating world-class contenders Klara Svensson and Mikaela Lauren, as well as world super lightweight champion Erica Farias. She’s never lost a fight, with a record that currently stands at 32-0, with 9 knockouts. Braekhus is also the only undisputed champion in women’s’ boxing. Christy Martin, who placed women’s boxing in the foreground in the 1990s, was greatly pleased that Braekhus is the first recipient of the award that bears her name. “First, to have an award named after you is really flattering,” Martin said. “I felt I gave a lot to the sport, so I’m very grateful for this. I’m really happy that it’s Cecilia. This is someone who has put in a great body of work. She’s had great support behind her in her country, and she’s the perfect and logical choice. “I’m honored Cecilia would ask for me to present her and meet her. She’s a great choice, she’s deserving and I’m happy it’s Cecilia—and she still has plenty of her career left.” Braekhus never met Martin in person. See More Women Boxing Champions in our World Liberty TV Boxing Channel by Clicking here. The Boxing Writers Association of America is proud to announce its 93rd Annual Awards Dinner took place on Friday, May 11, 2018, at the Copacabana in New York City. The event started with cocktails at 5:30 PM and dinner and awards at 7:00 PM. This year’s winners included: Vasiliy Lomachenko , as the Sugar Ray Robinson Fighter of the Year, and first Ukrainian fighter to ever win in the 80 -year history of the award; Cecilia Braekhus as the Christy Martin Fighter of the Year; Anthony Joshua and Wladimir Klitschko , as the Muhammad Ali-Joe Frazier Fight of the Year recipients; Daniel Franco, as the Bill Crawford Courage award winner; Dr. Margaret Goodman , as the Barney Nagler Long and Meritorious winner; Anatoly Lomachenko, as the Eddie Futch Trainer of the Year; Lou DiBella, for the Sam Taub Excellence in Broadcasting; Mike Rosenthal as the Nat Fleischer winner for excellence in boxing journalism; Wladimir Klitschko and Ed Keenan as the Marvin Kohn “Good Guy;” and Egis Klimas as the Cus D’Amato Manager of the Year. The BWAA is also proud to announce it will be honoring HBO ringside judge Harold Lederman. 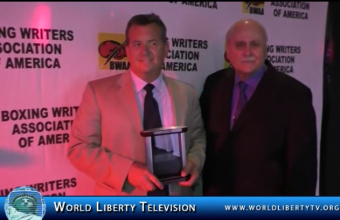 See more about BWAA in our World Liberty TV Boxing Channel by clicking here.